A personalized thank you note that your guests will absolutely LOVE and can hang on the refrigerator for months! The first step to the thank you postcard is buying the wooden letters, paint, paintbrush, and ribbon from Michael's or AC Moore. Don't forget these stores always have coupons, so wait until you get a good one to buy the supplies! I chose light blue paint because our wedding colors were blue, white and silver. I also knew the blue would be a good contrast against my dress and Matt's tux. Think about which of your wedding colors would look best, and if you are indecisive.... go with white! Once the letters are painted and have dried you can use super glue or a staple gun to attach them to the ribbon. Each letter should be about 1 inch apart. 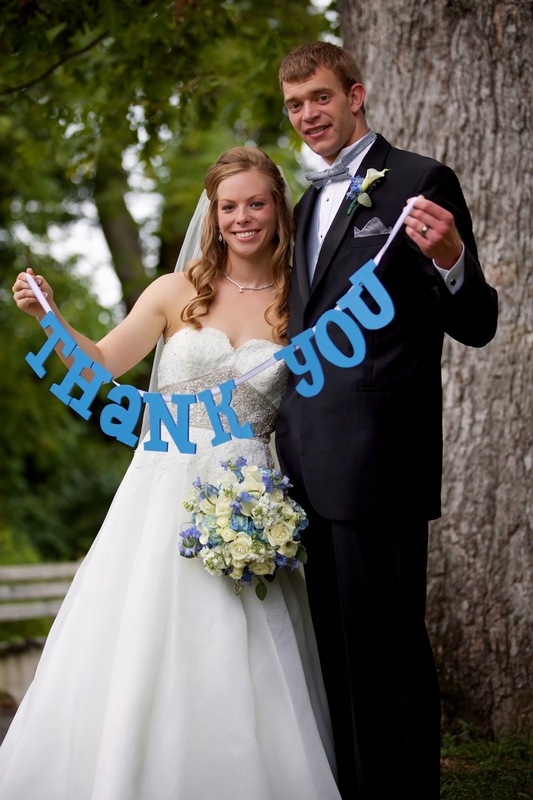 Leave about 1-2 feet at the end of the Thank You so you and your hubby can hold it easily during pictures. This project is similar to the DIY Wooden Letters. Once the project is complete, Add it to your list of things to bring with you on your wedding day. I left them at the front door of my parents house (where we got ready). When we were leaving for the church, I grabbed them and had them in the limo, ready to use after the ceremony. I had given my photographer David a heads up that we were going to be doing this. Giving your photographer a heads up of any special pictures you want taken is a good idea for a couple reasons. One, so you have another person to remember to take these pictures. Two, they can help you figure out a good background for the pictures. So I had the front of the postcard, but was unsure of what to do for the back. I went to google and searched "back of postcard" and found a blank picture of the back of a postcard. I saved it to my computer to use. 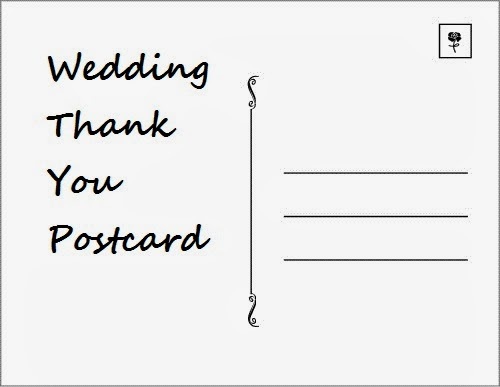 I had never made or ordered postcards before so I didn't know what company to use. Once again, google came to my rescue (love their searches!) I googled "print postcards" and tons of companies came up. I believe I used Vistaprint.com. It was super easy. 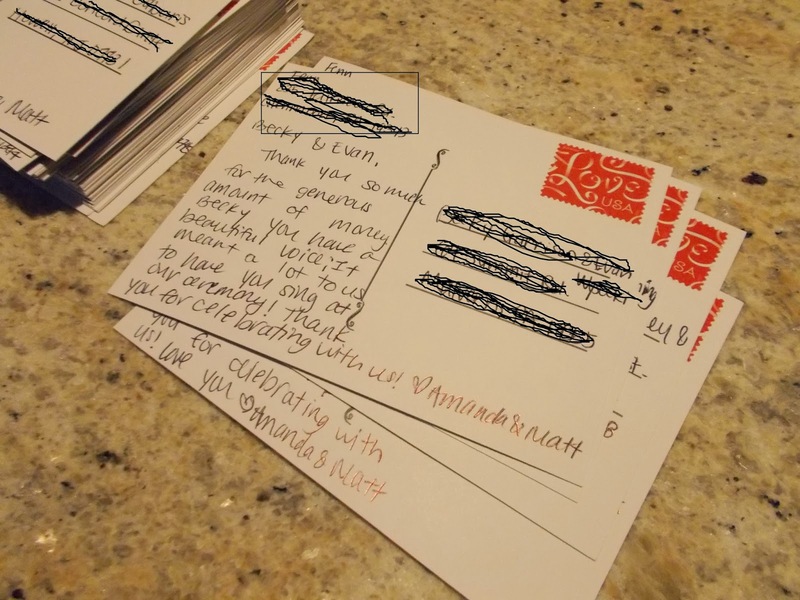 I uploaded the picture of us with the thank you banner and the postcard back picture. Then went through their simple ordering process. They were shipped within 2 weeks. During those 2 weeks, I made sure to pick up fun stamps at the post office. Hope you go the personalized thank you note route, guests really do love them! !